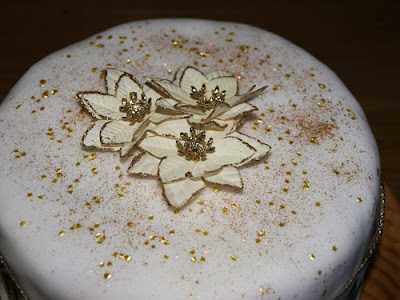 Farmersgirl Kitchen: Christmas Cake Bling! Here is my Christmas Cake decorated with holographic gold edible glitter and little gold cupcake stars - ooh I love a bit of bling! That was as far as I had got last weekend and there was definitely something missing. I found these cream and gold poinsettias at the local garden centre, they just finish it off perfectly! Oooh looks good enough to eat Janice lol I love the gold on it. Mine hasn't been marzipan'd yet let alone decorated. Janice that cake looks far to good to eat and the flowers finish it off perfectly. Very classy and elegant, great job! Your cake looks lovely - I'm a real sucker for gold. Looks bling-i-licious! Can never have too much sparkle! That looks gorgeous. Glamourous but not over the top - perfect, in fact! I love it. Look at that cake! It looks so elegant and classy :) How will you be able to bring yourself to cut it? !